The great thing about the Premier League, whether or not you believe it is the “best” league in the world, is that there is a high amount of parity among many of the teams. In so many other leagues around the world there are few weekends that carry more than one really big match per week. In week 30 of the Premier League there are several big games to watch out for. It is far more than a cliché to say that any team can win on any given day and this is certainly true for every match this weekend. Manchester City v West Brom: The reigning EPL champions have been stuttering lately and facing a more cohesive West Bromwich Albion first thing Saturday morning will not be any easy task. Man C have more than enough in the way of talent, but questions have been asked of them lately and whether they have become too complacent. One thing is for sure, there are a lot of Baggies players who will not be so complacent as they look to continue to impress. I’m predicting a Man C win, but wouldn’t be surprised at all by a draw or even a West Brom shock win. Aston Villa v Swansea: Aston Villa has become something of an enigma. At one point there were players (Harry Kane, Sergio Aguero, and Diego Costa) who had scored more goals individually than the team had scored this season. Last weekend’s 4-0 win changed that. Since Swansea hit 40 points several weeks ago they have really dropped off with back to back losses. They may have been unlucky against Liverpool, but not scoring any goals will always leave you facing an uphill battle. Which teams will show up on Saturday morning remains to be seen. Swansea City’s early season form has not been seen for the better part of the month while Villa are starting to look like a freshly rejuvenated side pulling themselves away from the bottom three. This has the makings of a draw, but I’m picking Aston Villa for the win considering their recent good form. Newcastle United v Arsenal: Newcastle have the look of a team in transition and simply treading water in the middle of the table. Back to back losses and only one win in six games means that they might need to start looking over their shoulder for fear of a relegation battle. After all, they are still gifive points away from the safety of a 40 point season. Arsenal are currently second in the form table with five consecutive wins following their 2-1 loss to Tottenham. Their midweek Champions League win over Monaco may be enough to continue their momentum despite the fact that it leaves them out of the European competition. I am giving my prediction here as an Arsenal win. Stoke City v Crystal Palace: I’m going to start out with my prediction of a draw here; perhaps with goals or perhaps a 0-0. Both of these teams have been difficult to predict. Crystal Palace are moving in the right direction and starting to look decent, but they continue to be inconsistent with their current form seeing them go with a W, D, L, W, L, W, which lines them up for another loss. Stoke are just as inconsistent, but do have a decent home record where they are 7-2-5 with a +2 goal difference from 19 scored and 17 allowed. This should be an interesting match, but very difficult to predict. As stated before I am predicting a draw, but would shade Stoke for the win. Tottenham Hotspur v Leicester City: On paper this should be a walk in the park for Spurs against bottom of the table Leicester City. Heading back home to White Hart Lane following their horrible 3-0 loss to Manchester United means that they should be up for a fight. At the same time, perhaps that was the turning point in their season. I think most fans are waiting for that time when Spurs just gives up the season and coasts. This is one of those matches that they will need to keep their focus, because Leicester still have hopes to pull themselves out of relegation. I am predicting a Spurs win, but they will need to be careful. West Ham United v Sunderland: Making a prediction of this match is nearly impossible. These are two teams trending downwards rapidly. West Ham’s 39 points to date basically put them in the clear away from relegation, which seems to have put them into the mood to simply play each game without any expectation of winning. Sunderland’s change in manager can only be a good thing, but it could be too little too late. Their has been a definite atmosphere of mediocrity surrounding Sunderland, especially in the second half of this season. There was a point in time when I thought they would be safe in the middle of the table, but those days are long gone. I am predicting a draw in this match, though that is due mainly to the equal malaise of both teams. Hull City v Chelsea: I am not going to write off Hull City in this one. Chelsea have looked tired and beatable lately, complacent even. They have more than enough quality and individual talent, but a well organized team has every chance of getting a result. Hull may not be that team, but anything is possible in the Premier League. Queens Park Rangers v Everton: QPR look doomed to yet another relegation while Everton have started to pick up a recent run of form. It is a very recent run of form going back just a week, but it is still something that they can build on. It seems that you have to pick Everton for this one considering QPR’s recent record with just one win in their last 12 EPL matches. Liverpool v Manchester United: This derby is one of the most hotly contested rivalries in all of world sports and considering the two point gap between them in the table, this should be an intense clash. It is the kind of match that should be capping the weekend, but gives plenty of people a reason to wake up early on Sunday morning. The last six matches between these two teams has ended in a win with United holding the edge with 4 wins to Liverpool’s 2. This includes Manchester United’s 3-0 win back in December. Despite this Liverpool hold a clear edge when it comes to playing at Anfield with 4 wins and 1 draw against Manchester United’s 1 win. All of this leads to a match that will be very close. It will be a tactical battle from the start and holds many questions as to which players will be starting. Both sides have several options and it will be interesting to see who will be in the starting lineups and how they line up. My prediction for this derby is a scoring draw, but, as in most derbies, could easily go either way. 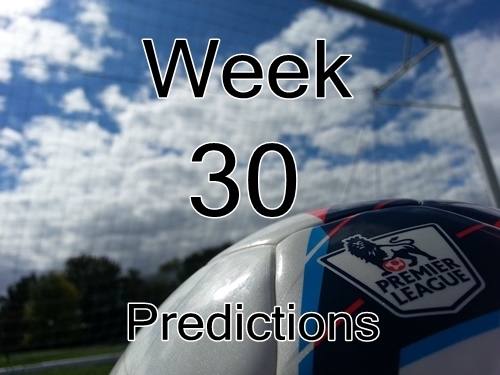 That wraps up another week of Premier League predictions. Hopefully some of these previews can help you out with your FPL team for the week. As always, enjoy a weekend of excellent matches!